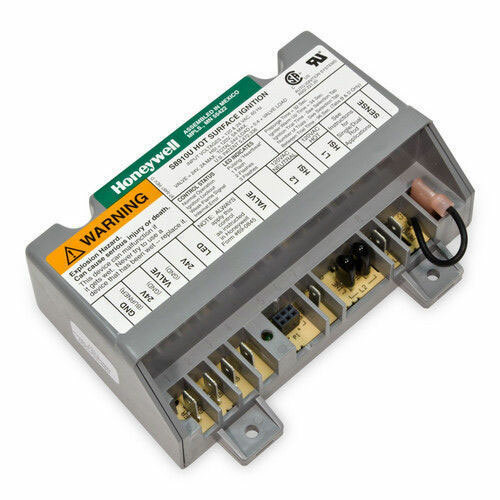 Honeywell S8910U3000 universal hot surface ignition module control. Replacement for multiple field installed hot surface ignition modules supplied by Honeywell, White-Rodgers, Robertshaw and Johnson. Uses a 120 VAC igniter. Includes cross reference, instructions, and accessories for easy replacement. Replaces over 800 White-Rodgers, Robertshaw and Honeywell hot surface ignition models. For 120 Vac (up to 5.0A) surface igniter (Norton 201/271 or equivalent). For local (single rod) or remote (dual rod) rectification type flame sensing. Contains easy-to-use cross reference and instructions plus the accessories required to replace the existing hot surface ignition module. Provides one or three ignition trials (four-second or seven-second trials) per call for heat. Field selectable number of ignition trials and trial time based on unit being replaced.